When Labour's new leader addressed the party's conference last month, he turned on his tormentors for the puerility of their personal attacks on him. "Red Ed? Come off it," he said. "Let's have a grown-up debate about the future of this country." For many ordinary voters, however, it's a case of mistaking a decade of excessive consumption and irresponsible state spending for normal behaviour. Having been told that boom and bust were things of the past, Britain looked forward to a future of unlimited overdrafts. Thanks to Gordon Brown's recalibration of economics, government outlays would expand forever. Then, in the form of the credit crunch, an alarm clock went off and we awoke from a dream of something for nothing to a nightmare of bills that had to be paid. How on earth did we allow this to happen? At what point did a nation of shopkeepers start to believe that permanent tick was sound business practice? Between 2000 and 2010, had government's annual expenditure just kept pace with inflation, the budget would have risen from £343 billion to about £450 billion. In the event, Alistair Darling spent £669 last year and Mr Osborne will spend £697 billion this year. In real terms, over the past decade, there has been a 50 per cent increase in the state's outgoings. The effect has been the fiscal equivalent of you or me adding a few pounds of weight every year for 10 years. At first we barely notice the bulges; then we kid ourselves that the scales are wrong. Finally we are burdened with rolls of dangerous flab, but struggle to slim down, because after gorging for too long even a modest diet feels like starvation. For those who insist that Mr Osborne is about to slash spending to the bone, forcing us to survive on gruel and stale crackers, here are some inconvenient facts. If he delivers all his planned savings, £81 billion over the next four years (by no means certain, given the scope for interest groups to resist change), spending on public services in 2014-15 will still be higher in real terms than in 2006-07. Yes, higher. You doubt me? Have a look at page 17 of the Treasury's Spending Review 2010. It's all there. Never mind that Labour added about 800,000 workers (by no means all essential or British) to the public-sector payroll, forget that interest charges on our near-£1 trillion of debt will soon be costing the Exchequer £1 billion a week – distorting reality is so much more satisfying that facing up to one's own responsibilities. "Proponents and opponents alike have presented the coming spending cuts as draconian and savage," writes Dr Morgan. "But in reality the downpour turns out to be a shower, not a hurricane." If he's right, and we are not about to be blown back into an economic stone age, it's Labour's doomsayers who will need a Plan B. In the absence of a double-dip recession, Ed Balls's claim to forecasting competence will be threadbare. I keep reading that Big Ed is the real brain box on the Opposition benches, the only deep thinker with a thorough understanding of economics. Were that to be true, the country's finances would, surely, not be in such a mess? Mr Balls was, after all, Mr Brown's closest confidant at the Treasury, as he clocked up more than £160 billion of debt during the illusory boom years, 2003-07. No wonder Little Ed swerved round him when picking a shadow chancellor. If Labour is to oppose the cuts with integrity and credibility, it cannot do so on the basis of deceit and ill-founded intellectual arrogance. Many of these points have already been discussed on here. However for the pseudo-Keynesians we appear to have a problem the boom that we had from 2003 onwards where the BoE decided to cut base rates to support the economy the govt started deficit spending to support the boom. So when the inevitable bust came the cupboard was bare meaning the only way the govt could continue spending was by increasing borrowing to plug the funding gap. It's clear from the economic sense we should have swallowed the recession pill in 2003 and got it over with, instead our economic elite decided to create an even bigger boom which means a even bigger bust when everyone realises there is no money. Keynes argued you saved the surplus during the boom and Labour went and created a bigger boom by deficit spending in the boom to support the boom. This is pure economic suicide because at some point the bill becomes due. Interest spending is going to end up being one of the biggest expenditure of govt soon, meaning billions of taxpayer pounds will be spent on providing no service at all. The UK appears to be in a very structurally weak position, still I'm sure the recovery will help get the finances back in order. I expect Randall knows that government spending in 2000 as a percentage of GDP was the lowest it had been since 1988 and prior to that 1957. That is why he has used 2000 as his baseline. For the bulk of the period from 1965 to 1986 it averaged 43%. During the early to mid-nineties it rose above 40% again peaking in 1996. It fell below 35% in 2000 and since then stayed under 40%, albeit rising steadily, until 2008/09 when due to the recession and consequent decline in GDP the proportion of state spending to GDP went over 45%. Government spending as a proportion of GDP was not exceptional during the last ten years and only appears so now due to the absolute decline in GDP during the recession. Deficit spending prior to the recession ran at around 2 to 3% which again was not profligate. Randall overstates the case because he is conservative supporter and a journalist taking his shilling from Murdoch to support the coalition, it is his job. Look at the facts (such as they are) of the matter in their historical context and with some sense of persepective and they appear as they really are. Our political positions are the distorting lense which we use to interpret these facts to support our arguments. If you factor that in how does that affect the figures? We've been deficit spending for decades, at some point it will have to end. Even at 2-3% exponential growth will get you. Um, why was there deficit spending during the boom years? They say a picture paints a thousand words, however, on this occasion it paints only a few: That towards the end of the noughties, a certain Scotsman really really really wanted to win the 2010 General Election. The deficit , used to bribe the electorate with its own money. Looking only at the short term and to hell with the long term consequences. This is why public debt has reached 45% of GDP and will continue rising ( http://www.economicshelp.org/blog/uk-economy/uk-national-debt/ ). The real point is, why does the government need any debt at all? For infastructure projects that can't be financed in a single tax year? Why for anything else? 1. Interest Payments. The cost of paying interest on the government’s debt is very high. In 2008 Debt interest payments will be £31 billion a year (est 2.5% of GDP). In 2009, they will be £35 billion (similar to defence budget). Public sector debt interest payments could be be the 4th highest department after social security, health and education. Debt interest payments are rising close to £70bn given rise in national debt. 2. Higher Taxes in the future. 6. Potential of Rising interest rates as markets become more reluctant to lend to the UK government. How progressive. The equivalent of 2/3 of the current NHS budget will be spent on interest to Bond holders. How can any socialist support this? The sooner the deficit is reduced, the sooner we can start paying off our 1trn debt. The sooner we will get £70bn back to spend on actual services that help the poor, not debt interest. We need a mechanism in place to prevent this kind of economic vandalism in future. Politicians who spend public money to serve themselves rather than the public should face treason charges. It came from China Jeff old son. Where've you been for the past decade. thats all very interesting, except, you forget to mention that GDP INCLUDES public spending...so the more public spending, the more GDP is and a mathematical quirk makes it all look tickety boo, when, no, its a fiddle designed to deceive. Has Murdoch bought the Telegraph as well now ? Spend within your means. How is that for an econimic principle to follow ? Pretty simple. The Scottish Governemnt have been pushing hard for a few years now for powers to raise extra finance through debt. At the moment they get a huge pot of money and can spend it as they wish - however they cannot go a penny over. They think being able to get into debt is a preferable situation. That tells me enough about people's thinking in this country. Spend what you have. Some years you will have more. Some years you will have less. Cest La Vie. Get on with it. Of course there is one problem with all this. Many powerful people/groups quite like a lot of people to be in a lot of debt. You can cream off the top. I don't really agree with the use of PFI. However, since 1992 when it first started being used in the UK, up to October 2007, there have been £68 billion in contracts with estimated future liabilities of £215 billion. Over the course of PFI contracts which on average are 30 years this would equate to just over £7.16 billion a year in expenditure. On reflection it seems the use of PFI isn't as great as presented in the media and the liabilities aren't as scary as they are usually talked up to be. The same could be said of a lot of things. Government is all about deficit spending and taxation. There have been a handful of years in the last three hundred in which a surplus has been run. The last time was 1998 - 2000. There has been almost continual deficit spending during era of the modern state but mostly inflation has eroded the real value of the accrued debt, hence the desire of Governments to avoid deflation and to tolerate inflation. The national debt and deficit have been made into political issues in order to win the election and will recede in rhetorical importance the further away we get from it. No but Randall works for Sky too and reaches a wider audience that way. sure thing that inflation has eroded the debt, but inflation also increases the amount of borrowing come the next spending round, so the deficit increases, as does the interest upon interest that inflation was supposed to take care of. Inflation NEVER pays off debt.....only wealth creation does. GDP is a measure of the activity of the economy. All sectors are included, including the government. The proportion of activity due to government spending is the important factor in judging whether government spending is sustainable. Between 2000 and 2008 GDP increased by £472 bn, government spending by £237 bn, hence why spending increased from 35% of GDP in 2000 to 39% in 2008. It would make no sense to exclude government spending as this is a real part of the total economy. That's why economic growth is the only real way to reduce the deficit. "Where will the growth come from?" Rising tax income is the only way to pay off the deficit. It is quite possible for the economy rapidly and the deficit to widen at the same time. What matters is how the growth is generated, all growth is not equal. Excessive Government spending does not create any sustainable growth or Jobs. It is funded from the private sector through tax. Once the tax burden get’s too high the private sector will be stifled. We need an efficient private sector that is incentivised to manufacture, innovate, exploit resources more efficiently and most importantly export. If we do not cut back spending the resulting taxation burden will crush the private sector. We do not need excessive consumption fuelled by debt. 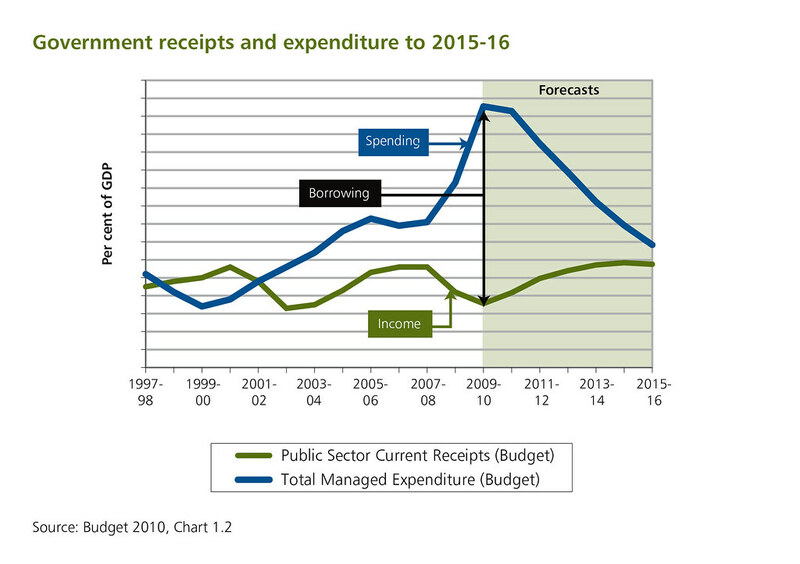 More Public spending, House price inflation, and more debt. This will create growth but not wealth or sustainable tax income. Government spending does not create any sustainable growth or Jobs. It is funded from the private sector through tax. Once the tax burden get’s too high the private sector will be stifled. The tax payer funded Universities and Medical Research Councils are responsible for the research that is the foundation of masses of jobs. One corridor of workers in the LMB in Cambridge is pretty much responsible discoveries that generate hundreds of millions for the tax payer each year and a lot of the advances in medicine over the last decade. The key point here seems to be "too high". Obviously a certain level of government spending is beneficial. Funding Universities and Medical Research Councils should be top of the spending priority list. A better trained workforce, R & D and innovation will aid growth massively. The problem with University funding seems to be large numbers of students doing degrees that do not offer the tax payer value for money. They do not have sufficient benefit to the student the economy or society to justify the cost of the course. Ensuring those who have the most ability rather than those who have the most money attend university should be a key education spending priority as well. it is the part that is SPENDING the product of the private sector. Whilst it is true that some spending is necessary, to increase spending just to "get us out of recession" is purely a political stunt for the masses. GDP also includes the difference between imports and exports. GDP is also revised all the time, and revision is a trick used today more and more to make a worsening situation look a little more rosy. indeed, i would agree that the proportion of government spend is important, but as I have pointed out, indeed as the MArket ticker has graphs for, Government spend is used to counter wealthcreating private investment which has fallen alarmingly. All this does, rather than increase the spend on subsequently beneficial items, like some medical research, is to end up spending on mountains of paper clips, expensive office furniture,vehicle fleets and helicopters that cant fly in a light breeze. Yep, that's because some idiot will once more claim boom/bust has been abolished. Spending has been far too high for decades, hence the £842.9 billion overall debt (not deficit) which has accumulated over the years, and why we now pay more interest on our debt than we do on defence.